What do you use to store and carry your treasured lighting gear? Heavy and bulky professional flight-cases? Plastic storage creates? Or perhaps just the tatty remains of the cardboard boxes they came in? Well now there is another option, Arriba Cases, a new range of gear cases that promise to “protect your sound & lighting gear without breaking the bank”. 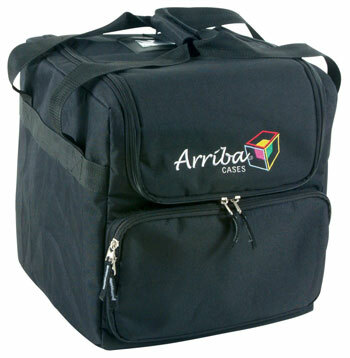 Arriba Cases are a new line of soft cases for mobile lighting fixtures and more. They have been designed specifically for the mobile lighting market by a team with decades of experience in the industry; the new Arriba Case collection covers a wide range of gear, from small lasers to centerpiece effects from all major equipment brands. Made of durable synthetic material, the soft padded cases protect a DJ's investment in lighting by safeguarding fixtures against nicks, dints and scratches. This not only preserves the outward appearance of lighting effects, but also extends their useful life. Secure "view windows" on Arriba Cases make it easy to identify specific fixtures even after they've been packed. The cases' extra wide mouth design allows gear to be removed quickly and easily. Another convenient feature found in most Arriba Cases is the secured zipped pocket for storing extra lamps, clamps and other accessories. Arriba Cases offer an added benefit for performers on the go by allowing gear to be stacked without having to be boxed. This saves valuable transport space in cars and vans. Arriba cases are available to buy online and from stores across the UK.